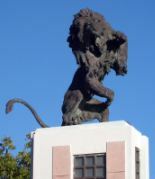 El Puente de los Leones – an elegant doorway bridge with two emblematic guarding lions sculpted by the eminent Spanish artist Víctor Ochoa. One is young, spirited and untamable; symbolizing hope and the rebirth of Ponce’s valuable heritage, proudly looking after a brighter future for the City. The other, mature and wise; representing the redemption of the old town splendor and all the contributing citizens of its first three centuries of history. Plaza de los Ponceños Ilustres – Parque del Tricentenario's main square honoring all the illustrious Ponce citizens, with an inspiring fountain and wall plaques with the names of many (300) distinguished "Ponceñistas" in the fields of politics, architecture, journalism, literature, history, commerce and business, craftsmanship, education, medicine, civism, law, sports, music, plastic arts, dance and theater. At each side, there are two small squares with busts of former Ponce born Puerto Rico governors, Luis Ferré Aguayo and Rafael Hernández Colón, by famed Tomás Batista Encarnación, considered by many to be Puerto Rico’s greatest sculptor. One of its corners depicts one more Tomás Batista Encarnación bust of another famous Ponce adoptive son, former Puerto Rico governor Rafael Sánchez Vilella. Plaza de los Próceres Latinoamericanos – an additional Parque del Tricentenario square with busts by celebrated Puerto Rican sculptor María Elena Perales, honoring Latin American heroes from Cuba (José Martí), Venezuela (Simón Bolívar), Dominican Republic (Juan Pablo Duarte) and Puerto Rico (Luis Muñoz Marín).